This species is accepted, and its native range is Ivory Coast to SW. Uganda and Angola. Seeds black and shining with orange aril. Africa: Zambezian forest, Guineo-Congolian forest. Tall tree, 18–40 m. high; bark usually reddish-brown and scaly (but said on Sangster 538 to be “grey, fairly smooth”); young branchlets glabrous. Leaves:rhachis with petiole 9–32 cm. long; leaflets (4–)5–7(–8, fide F.C.B.) pairs, petiolulate, oblong to oblong-elliptic, 5–13(–20, fide F.C.B.) cm. long, 2.6–5.8(–7, fide F.C.B.) cm. wide, ± apiculate or shortly acuminate at apex. Flowers sweetly scented, with hypanthium 1.5–4.5 cm. long. Sepals densely tomentellous outside, outer 2 elliptic, 1–1.7 cm. long, 0.8–1.5 cm. wide, inner 2 obovate-elliptic, 1.4–2 cm. long, 0.9–1.6 cm. wide. Petal upwardly turned, 3.5–6 cm. long, with a long red-purple claw, and a crumpled ± bilobed lamina 3–5 cm. wide which is white at first and then turns pink. Stamens 7 fertile, with pubescent filaments, red like the style; staminodes 2, elongate, 0.5–2 cm. long. Pods curved-reniform, (8–)11–19.5 cm. long and 5.5–8 cm. wide (fide F.C.B.). Seeds black, ovoid-ellipsoid, 2.5–3.3(–4.5, fide F.C.B.) cm. long, 1–1.7(–2, fide F.C.B.) cm. wide, with a deeply bilobed orange aril, one at least of whose lobes reaches to about the middle or near the top of the seed. Lowland rain-forest; ± 900 m.
Léonard in Fl. Congo Belge 3: 355, t. 26, fig. 27 D.
Keay in Flora of West Tropical Africa, ed. 2, 1: 459 (1958). Torre & Hillcoat in Consp. Fl. Angol. 2: 216 (1956). J. Léon. 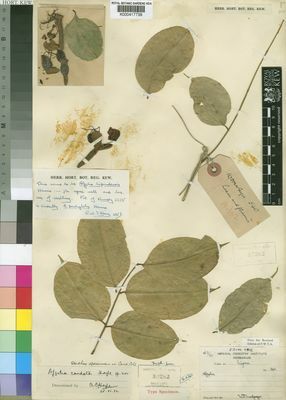 in Flore du Congo Belge et du Ruanda-Urundi, 3: 355, t. 26, fig. 27/D (1952). Chalk, Burtt Davy, Desch & Hoyle, Twenty W. Afr. Timber Trees (For. Trees & Timb. Brit. Emp. 2): 21, fig. 3 & photos. (1933). Chalk, Burtt Davy & Desch, Some E. Afr. Conif. and Legum. (For. Trees & Timb. Brit. Emp. 1): 28, 33 (1932). Bak. 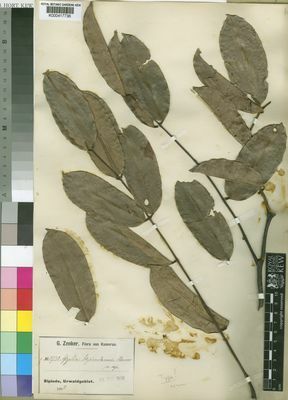 f., Leguminosae of Tropical Africa: 700 (1930). Harms in A. Engler, Botanische Jahrbücher für Systematik, Pflanzengeschichte und Pflanzengeographie 49: 426 (1913).